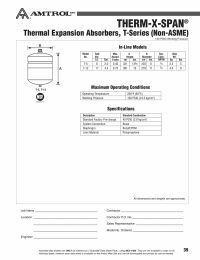 The Therm-X-Span T-12 Thermal Expansion Tank is a pre-pressurized diaphragm expansion tank. 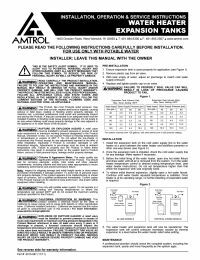 The tank is installed on the cold water supply line to the water heater to control pressure build up caused by thermal expansion. Installing the T-12 will virtually eliminate relief valves spills, protect plumbing fixtures and extend the life of your water heater. Install the expansion tank on the cold water supply line to the water heater at a point between the water heater and backflow preventer or other one-way device.